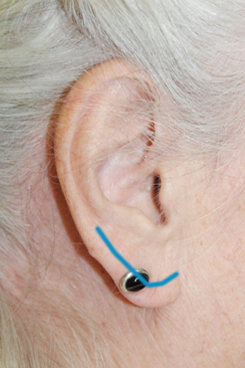 As you can see as you follow the helix down there is a general width of the helix that if you follow down into the earlobe, this is where a more natural looking incision can be placed. You can see this placement in the after picture above. Below is a diagram of where the incision is usually placed. 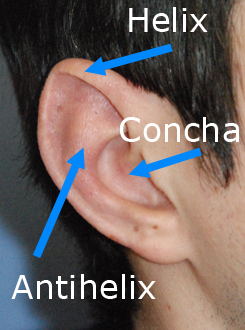 As you can see in the before and afters, the placement of the incision allows it to look natural, like the incision is a part of nature on how the earlobe should look like. Earlobe Ptosis or Pseudoptosis | Drooping: How do you know if your earlobes are too big? Below is a picture of an earlobe with some markings. The letter “I” denotes the Intertragal Notch. 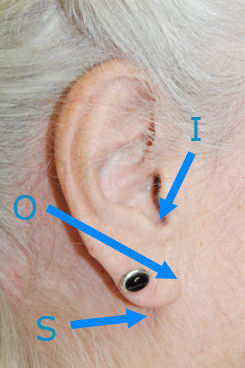 The “O” indicates the Otobasion Inferius or the attachment of the earlobe at the most inferior point. The letter “S” indicates the Subaurale. The normal distance that plastic surgeons consider “normal” for the distance between the I and O points should be 15 mm or 1.5 cm or less. If this distance was measure more than 15mm the diagnosis was called pseudoptosis. In this case we would shorten the O to I distance. The other distance to consider is the O to S distance. Normal is considered to be anywhere from 1 to 5mm. 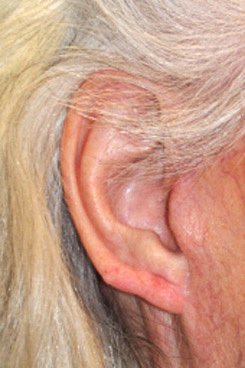 You can grade the severity of true Earlobe ptosis based on how much it is over 5mm. But over 5mm is consider Earlobe ptosis or true ptosis | drooping (ptosis is the facial plastic surgeon’s way of saying drooping). If the O to S distance is longer than 5mm we can reduce this as well. When you have both true ptosis and pseudoptosis we can reduce both segments. In the picture above, this patient had more pseudoptosis. If you have questions regarding this, we would love to answer them here: Aesthetic Facial Plastic Surgery Contact.